TMJ Temporomandibular joint disorderis a condition in which the temporomandibular joint, where the skull attaches to the jawbone, is not aligned or functioning properly. This results in extra pressure on the joint. The cartilage cushion wears away, leading to a popping sound when the jaw opens and closes, or difficulty in opening the jaw wide. Other common symptoms are headache, hearing loss or ringing in the ears, swelling of the face, and pain in the neck, ear, shoulder, cheek, or jaw. TMJ disorder can result from stress, repeated teeth clenching and grinding, a direct blow to the face, or an automobile or sports injury. Depending on the cause of TMJ, the treatment may include a soft diet to reduce stressful chewing, analgesics, muscle relaxants, biofeedback training to relax affected muscles, or dental appliances to reduce tooth grinding. Surgery can relieve pain in severe cases when medical and dental treatments have failed. There are many factors that cause or aggravate TMJ. Tooth disorders are a leading cause. Grinding, clenching the teeth, unaligned bite and excessive gum chewing can cause wear in the joint lining. The temporomandibular joint is made up of a ball, a socket, and a cushioning disk lined with cartilage. This joint takes a considerable amount of wear and tear, since it is used every time you chew, swallow, or talk. If the joint is not properly aligned or not working correctly, the smooth cartilage that allows the joint to move easily may become worn down. This causes the ball of the joint to rub against the socket, leading to such symptoms as pain, swelling, and popping or clicking sounds when chewing. 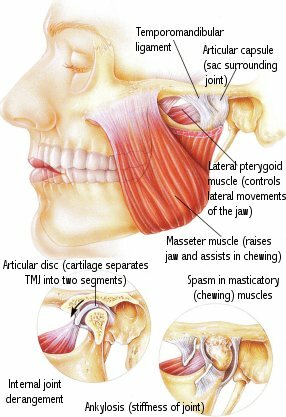 How Does TMJ Develop? There are actually several causes of TMJ. Many are related to the teeth. Teeth grinding and clenching, an unaligned bite, excessive gum chewing or uneven chewing (favoring one side over the other) can cause wear in the joint lining. Teeth clenching, often an unconscious result of anxiety, can be the source of TMJ symptoms during periods of high stress. Even poorly fitting dental work, especially of orthodontic appliances, can lead to TMJ disorder. Another source of TMJ disorder is trauma to the face, perhaps resulting from an automobile accident or sports injury. What Are the Symptoms? The most common symptom of TMJ disorder is a clicking or popping sound when the jaw is moved, especially when chewing. Some patients complain of a grating sound when the joint is moved, or they may have difficulty opening or closing their jaw. The jaw may actually become dislocated, causing it to lock open or closed. Often, there is pain around the joint when it is used for chewing, talking, and yawning. The pain may be sharp or dull, and it may move to the head, cheek, and teeth. Symptoms that involve the ears include tinnitus (ringing in the ears), pain around or behind the ear, sensitivity to sound, and dizziness. Other symptoms related to TMJ are headache, neck and shoulder muscle aches, and tooth pain. Using a heating pad and anti-inflammatory medications (such as aspirin, ibuprofen, or naproxen), as instructed by your doctor. Your doctor may also recommend local anesthetic injections, muscle relaxants, and pain medications if the above remedies do not improve your symptoms. A dentist or oral surgeon may be consulted in the treatment of TMJ to determine if a problem in your bite is the cause of your symptoms. Restorative dentistry may be necessary to correct improper bite. If other treatments are not successful, surgery may be indicated to treat severe cases. If you have symptoms of TMJ disorder, see your doctor. Early treatment can help avoid serious TMJ disorder, which can result in joint destruction.